Summer is right around the corner, and summer bodies are made NOW! Join the Spring Into Summer Contest to help motivate yourself and see results. To win, you must have the best body fat % change. This is based on your starting numbers and ending change. It is a relative formula based on where you started and very fair with other contestants. To jump start your bodyfat loss, we will have a 14 day challenge the week of March 5th. This challenge will include daily goals to inspire you, clean eating tips, and exercise challenges. Cost for the contest is $30. The contest is free for the body comp test, goals, tips, etc. The $30 goes to the winners! The last challenges, winners received $600+ in cash! Need some more motivation? Get your friends and family involved! Studies show that the more support you have, the more successful you will be! Refer a friend and receive a free class! Get a buddy and walk, lift, jog, and work your way to results to feel great this summer! Need help with cardio? For those interested, I will be asking if anyone wants to do a 5k running challenge. Start now with a walk/jog to build to a 5k group run/jog in May? Need a plan? Latest research/studies state everyone should be doing weight training minimum 2x per week, interval cardio 2x per week (20-30 min), steady state cardio 45+ min 1-2x per week, and stretching/flexibility plan. My group classes below offer this in the form of M/W or T/Th group weights, Fri cardio intervals, and stretching/abs with each class. Make a plan now for a healthier you this year! 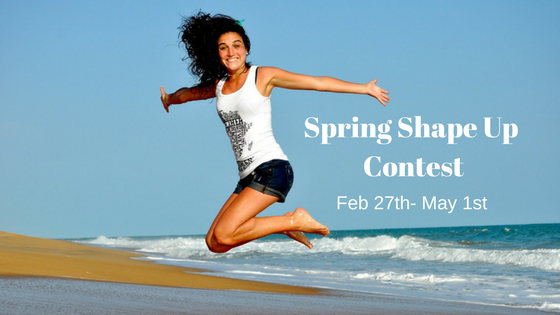 What: Spring Shape Up Contest – weekly workouts, clean eating menu, challenges, motivation! How to win: Have the best % bodyfat change – This is a relative formula so it is fair if you have more bodyfat to lose/muscle to gain you can compete fairly with others. Requirement: Training 1 x per week with Serena in class, private, consult, etc. Some of these groups are filling up, so please let me know in advance if you want to join in! Mon/Wed – Day One/Two Groups Circuit Weight Training– 5:30 a.m., 7 a.m., or 8:15 a.m.
Fri – Hiit (cardio/toning) 5:30, 7 a.m.